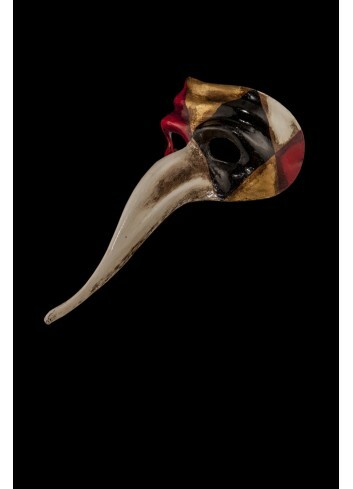 Original venetian masks, entirely handmade in Venice according to the artisan method. 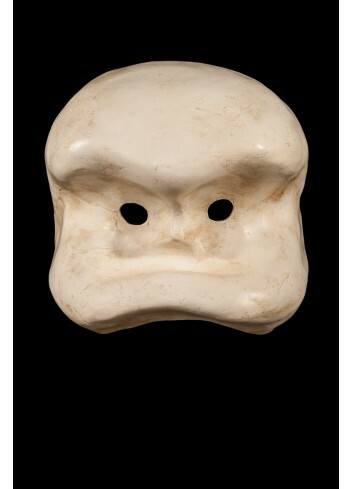 These models recall the well-known masks worn by the Commedia dell’Arte characters (XVI - XVII century). Arlequin authentic venetian mask in papier mache. Handcrafted according to the original Venice carnival tradition. Manifactured in Venice by the famous venetian masters. Each item is provided with certificate of authenticity. Capitan Spaventa Ready To Ship! Capitan Spaventa authentic venetian mask in papier mache. Handcrafted according to the original Venice carnival tradition. Manifactured in Venice by the famous venetian masters. Each item is provided with certificate of authenticity. Pulcinella Classic authentic venetian mask in papier mache. Handcrafted according to the original Venice carnival tradition. Manifactured in Venice by the famous venetian masters. Each item is provided with certificate of authenticity. Pulcinella Black authentic venetian mask in papier mache. Handcrafted according to the original Venice carnival tradition. Manifactured in Venice by the famous venetian masters. Each item is provided with certificate of authenticity. Zanni authentic venetian mask in papier mache. Handcrafted according to the original Venice carnival tradition. Manifactured in Venice by the famous venetian masters. Each item is provided with certificate of authenticity. Zanni Blue Craquelé authentic venetian mask in papier mache. Handcrafted according to the original Venice carnival tradition. Manifactured in Venice by the famous venetian masters. Each item is provided with certificate of authenticity. Zanni Red Craquelé authentic venetian mask in papier mache. Handcrafted according to the original Venice carnival tradition. Manifactured in Venice by the famous venetian masters. Each item is provided with certificate of authenticity. Scaramouche Baroque Ready To Ship! 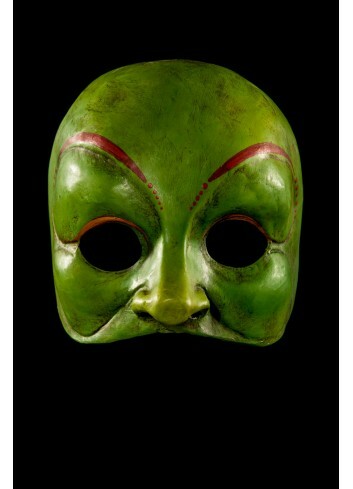 Pantalone: Authentic venetian mask in papier mache. Handcrafted according to the original Venice carnival tradition. Manifactured in Venice by the famous venetian masters. Each item is provided with certificate of authenticity. Black Zanni Ready To Ship! Black Zanni authentic venetian mask in papier mache. Handcrafted according to the original Venice carnival tradition. Manifactured in Venice by the famous venetian masters. Each item is provided with certificate of authenticity. Curved Zanni Parade Red and Gold authentic venetian mask in papier mache. Handcrafted according to the original Venice carnival tradition. Manifactured in Venice by the famous venetian masters. Each item is provided with certificate of authenticity. Brighella authentic venetian mask in papier mache. Handcrafted according to the original Venice carnival tradition. Manifactured in Venice by the famous venetian masters. Each item is provided with certificate of authenticity. Neutral Larval Mask authentic venetian mask in papier mache. Handcrafted according to the original Venice carnival tradition. Manifactured in Venice by the famous venetian masters. Each item is provided with certificate of authenticity. Neutral Larval Mask II authentic venetian mask in papier mache. Handcrafted according to the original Venice carnival tradition. Manifactured in Venice by the famous venetian masters. Each item is provided with certificate of authenticity. Neutral Larval Mask III authentic venetian mask in papier mache. Handcrafted according to the original Venice carnival tradition. Manifactured in Venice by the famous venetian masters. Each item is provided with certificate of authenticity. Neapolitan Pulcinella authentic venetian mask in papier mache. Handcrafted according to the original Venice carnival tradition. Manifactured in Venice by the famous venetian masters. Each item is provided with certificate of authenticity. Neutral Larval Mask IV authentic venetian mask in papier mache. Handcrafted according to the original Venice carnival tradition. Manifactured in Venice by the famous venetian masters. Each item is provided with certificate of authenticity. Neutral Larval Mask V authentic venetian mask in papier mache. Handcrafted according to the original Venice carnival tradition. Manifactured in Venice by the famous venetian masters. Each item is provided with certificate of authenticity. Pirate authentic venetian mask in papier mache. Handcrafted according to the original Venice carnival tradition. Manifactured in Venice by the famous venetian masters. Each item is provided with certificate of authenticity. Venetian Pantalone authentic venetian mask in papier mache handcrafted according to the original Venice carnival tradition. Manufactured in Venice by the famous venetian masters. Each item is provided with certificate of authenticity. Basic Plague Doctor authentic venetian mask in papier mache handcrafted according to the original Venice carnival tradition. Manufactured in Venice by the famous venetian masters. Each item is provided with certificate of authenticity. Pierrot Wall Mask Ready To Ship! Pierrot authentic venetian mask in papier mache handcrafted according to the original Venice carnival tradition. Manufactured in Venice by the famous venetian masters. Each item is provided with certificate of authenticity.